We supply to retail customers and contract customers. We can make made to measure curtains with the following headings: Tab Top, Triple Pleat, Double Pleat, Eyelet and Pencil Pleat. 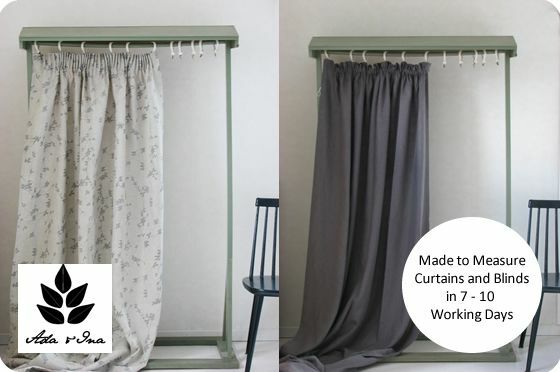 Our experienced curtain makers can also make curtains with following lining alternatives: Cotton lining, Blackout lining, Thermal lining, Blackout lining and interlining, Thermal lining and interlining. From our vast array of linen fabrics you can find varying qualities of linen for made to measure curtains and roman blinds. We are constantly adding new designs and changing our existing range to keep our collection of curtain fabrics interesting, fresh and contemporary. We have fabrics to cater for numerous uses such as: cushions, light curtains, sheer curtains, heavy and warm lined curtains. Order fabric samples of our linen fabrics from our Designer fabric collection. You can order up to 5 samples free of charge. Measure the curtains and/or blinds according to our instructions. Would you like to have blinds or curtains? Sizes - measure the drop and width for your curtains or blinds - please see the instructions from our website. Lining - would you need some extra insulation or block out some light or are you happy with simple cotton lining? You can select the right lining when configuring you curtains. Heading (curtains) - simple pencil pleat or maybe something fancier.